PORTLAND, Ore. (AP) — The federal government on Wednesday leveled additional charges against Ammon Bundy and dozens of others who staged an armed takeover of a national wildlife refuge in Oregon. One weapons allegation carries the possibility of life in prison. A grand jury indicted Bundy and most of his co-defendants on a new charge of firearms possession in a federal facility after the group seized the nature preserve in January to oppose U.S. land restrictions. Others are accused of a second firearms allegation, theft or damaging an archaeological site considered sacred to the Burns Paiute Tribe. The new charges come as the government cracks down on Bundy, his family and others for leading armed standoffs in a long-running dispute over management of public lands in the Western U.S.
Federal authorities have charged Bundy’s father, Cliven Bundy, and several others in recent months with conspiracy, assault and threats in a 2014 armed standoff over grazing rights near the patriarch’s Nevada ranch. Ammon Bundy’s attorneys told the judge that he wanted to be advised of his rights. U.S. District Court Judge Anna Brown denied the request, noting that they were read at three prior court appearances. 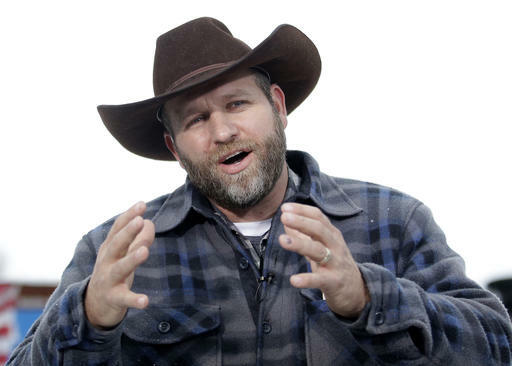 “I know I have no rights, so thank you,” Bundy said. He and eight others, including his brother, Ryan, were charged with carrying a firearm in relation to a crime of violence, which has a maximum penalty of life in prison. Sean Anderson and a defendant whose name was redacted from the indictment were charged with damaging the tribal site “by means of excavation and the use of heavy equipment,” Assistant U.S. Attorney Ethan Knight said. The judge scrapped an April trial date, agreeing with prosecutors to designate the case as “complex.” The move ends the right to a speedy trial sought by the defendants. The judge cited the volume of evidence and number of defendants. “I think any person looking at this room would have to concede this case is complex,” said Brown, peering down at three rows of tables filled with men in prison garb and their defense attorneys. The indictment comes a day after a county prosecutor concluded that Oregon police were justified in shooting Arizona rancher Robert Lavoy Finicum, a key figure in the standoff who died during a Jan. 26 traffic stop that also led to the arrests of the Bundy brothers and others. However, FBI agents are under investigation for failing to disclose they fired two shots during the confrontation with Finicum as he exited his truck. Neither of those shots hit Finicum. Oregon authorities say one of the two rounds hit the roof of the truck. The Bundy gang – the gift that keeps on giving. With more charges coming soon to a criminal near you. And for all their disregard for the Constitution and government, they want to be sure they get everything they have coming. The irony is, they will. Wooooohooooooo lock them all up !